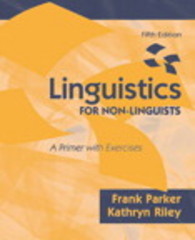 Linguistics for Non-Linguists 5 Edition Linguistics for Non-Linguists is a highly readable introductory text that presents students with the basic elements of linguistics in a clear and concise style that any beginner will understand. This newly revised edition continues to expand on the success of earlier editions, taking a subject that is generally considered quite complicated and making it accessible to virtually anyone who requires a basic understanding of linguistics. The authors illustrate major concepts in an easy-to-read style, giving students and specialists in language-related fields an introduction to the essential principles and methods of linguistic theory. Non-linguistics majors will also find this book user-friendly, with a wealth of exercises and references interspersed throughout to help reinforce concepts. Specialists in language-related fields, including Speech-Language Pathology, Experimental Phonetics, Communication, Education, Psychology, and English as a Second Language, will find this text a must-have reference for all courses.